Selecting new books. If you like learning about the many wonderful new natural history science books that are being published, you can help by selecting books from publisher websites and catalogs. Most natural history science publishers will donate books to the Institute if we publish a book review in one of our scientific journals. Writing book reviews. If you enjoy creative technical writing, you can help by being the first one to become familiar with newly arrived books and then writing concise book reviews. Thanks to your effort in this way, the books all remain in the Eagle Hill library as a community resource. Organizing the library. 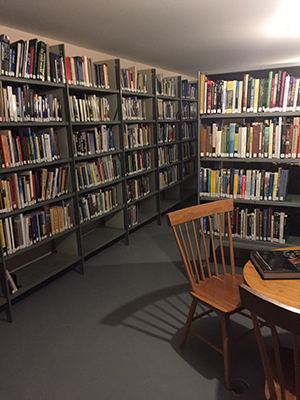 If you have a fondness for orderliness and appreciate how helpful it is to have a well-organized browsing library, you can help by shelving newly arrived books as well as ones that have been loaned to patrons, among other tasks. Online databases. The Institue has access to JSTOR and potentially other online databases that are of interest to library patrons. We would welcome help in working out access to databases that are available through the Maine School and Library Network, of which the Institute is a member under the name, "Eagle Hill Athenaeum."